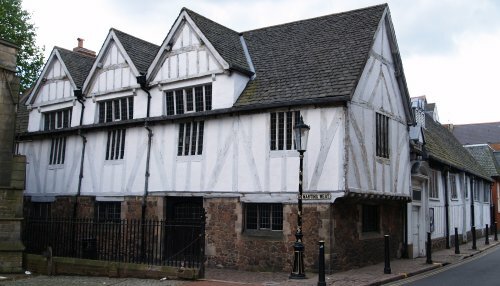 The Guildhall with the tall spire of St Martin's Cathedral Church towering above it. 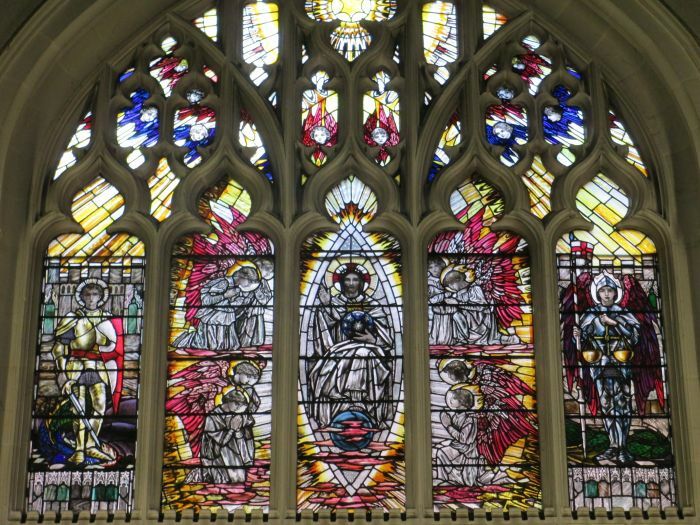 The spire was added in 1860as part of the Victorian restoration by Raphael Brandon. 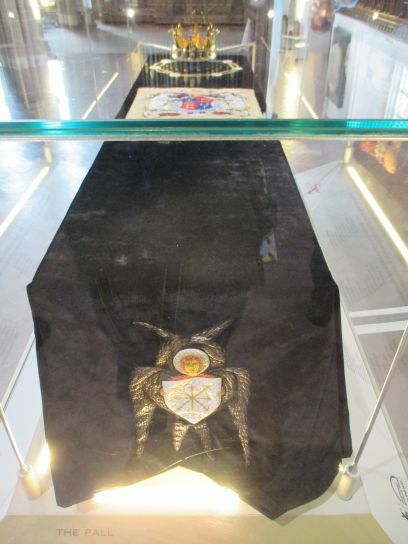 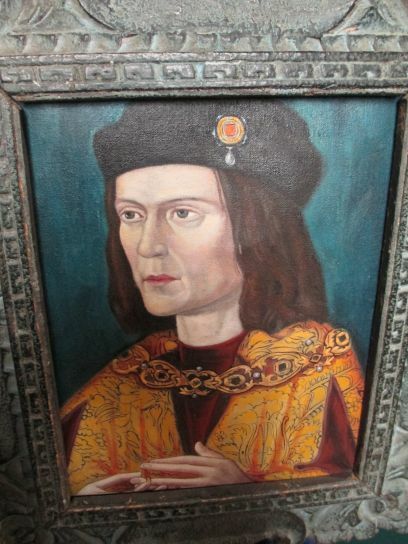 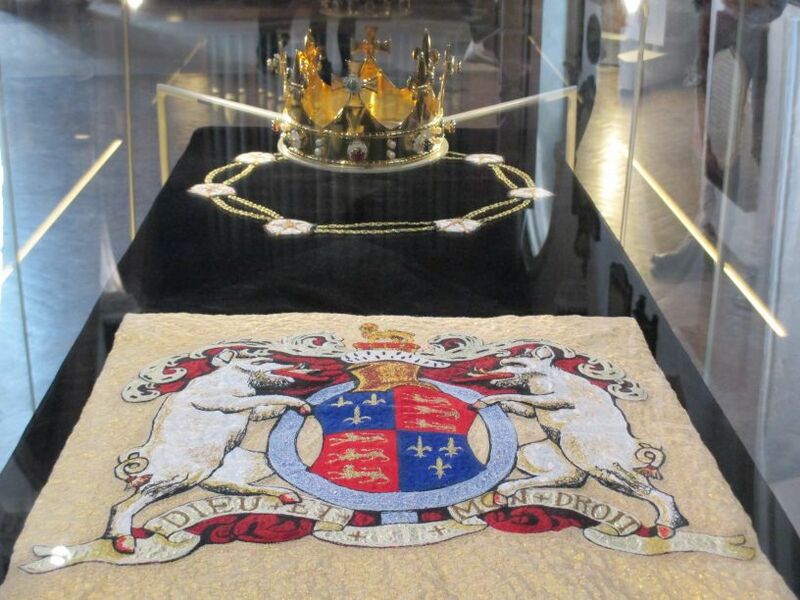 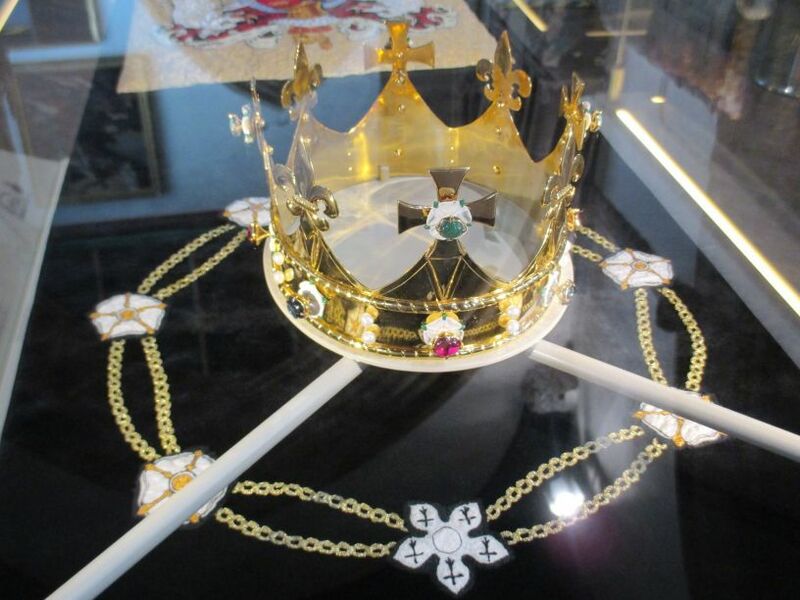 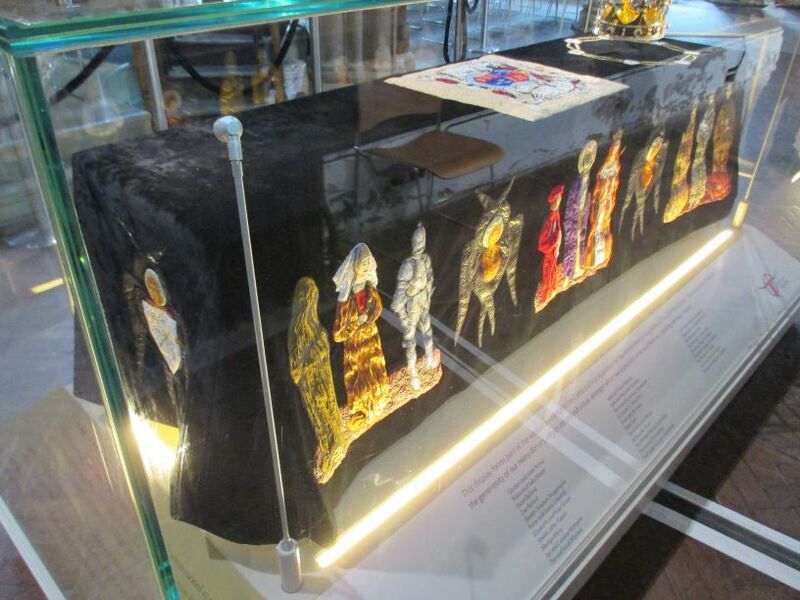 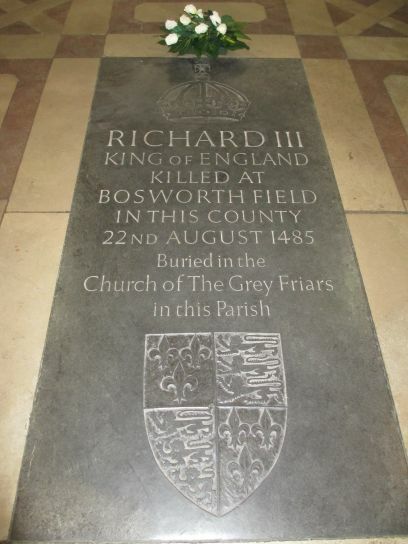 St martin's Cathedral is now the 'home' of the 2015 Tomb of King Richard III whose remain were found in the old grounds of Greyfriars Church. 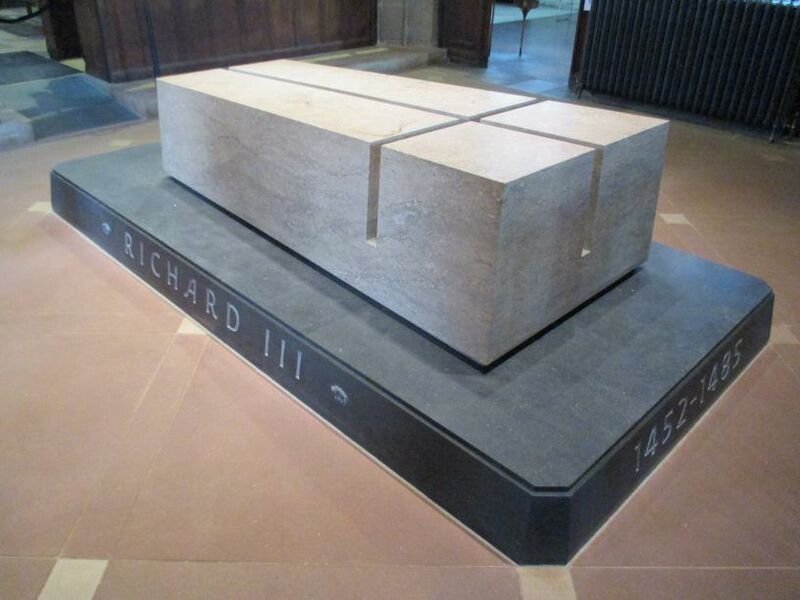 A section on Richard's tomb is at the end of the page. 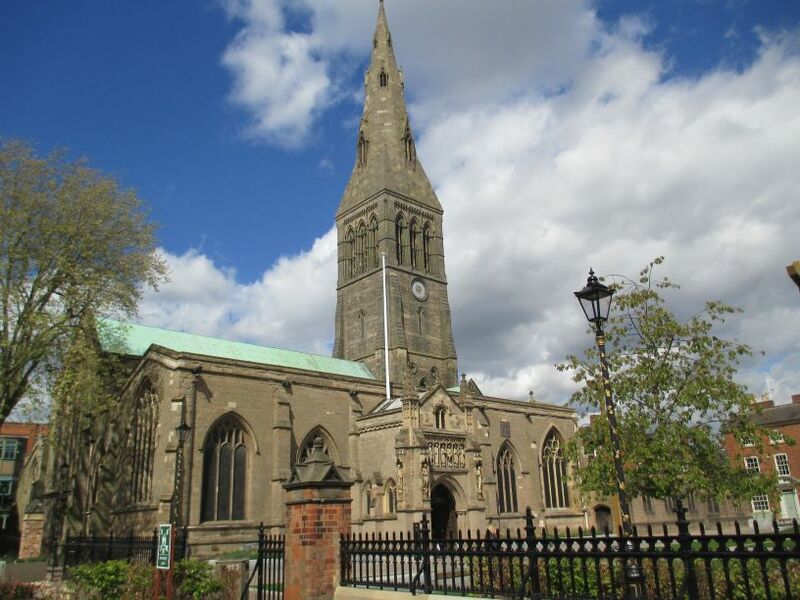 St Martin's Cathedral Church, Leicester. 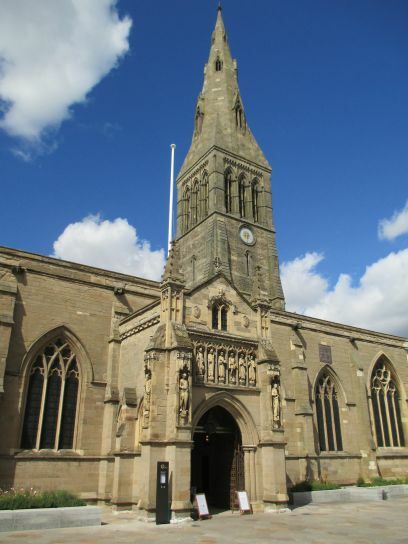 St Martin's originates from a Norman church of the 12th century. 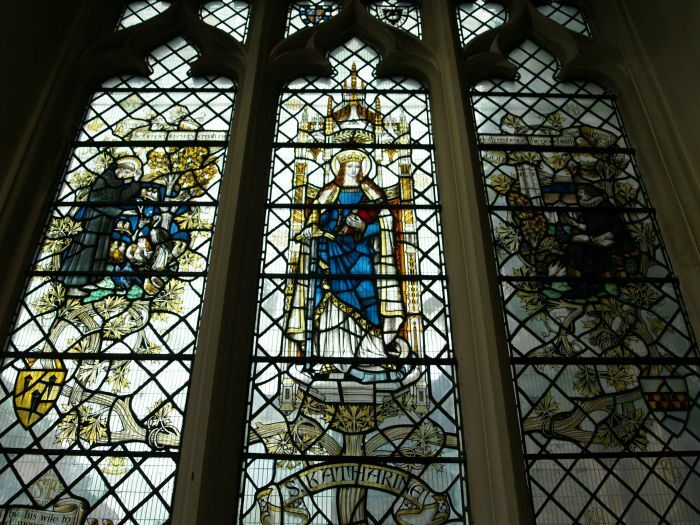 From archaeological finds below the foundations of the present church, the site was probably a pagan sanctuary which later became a Christian Saxon church prior to the Norman Conquest of England. 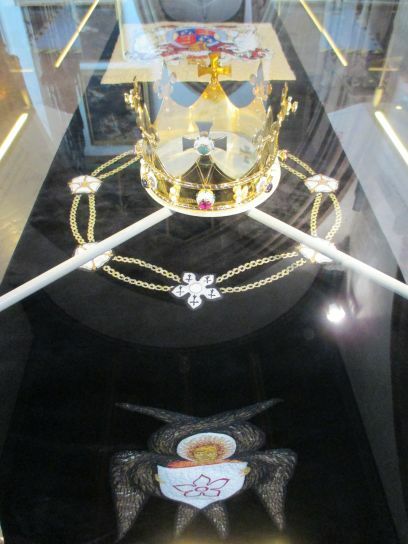 The great medieval oak chest in St Martin's Cathedral, complete with iron bands, locks and ring. 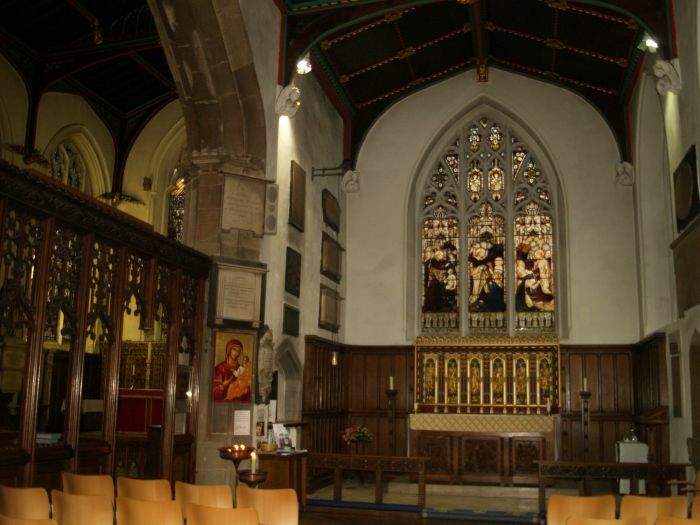 It is now used to collect donations. 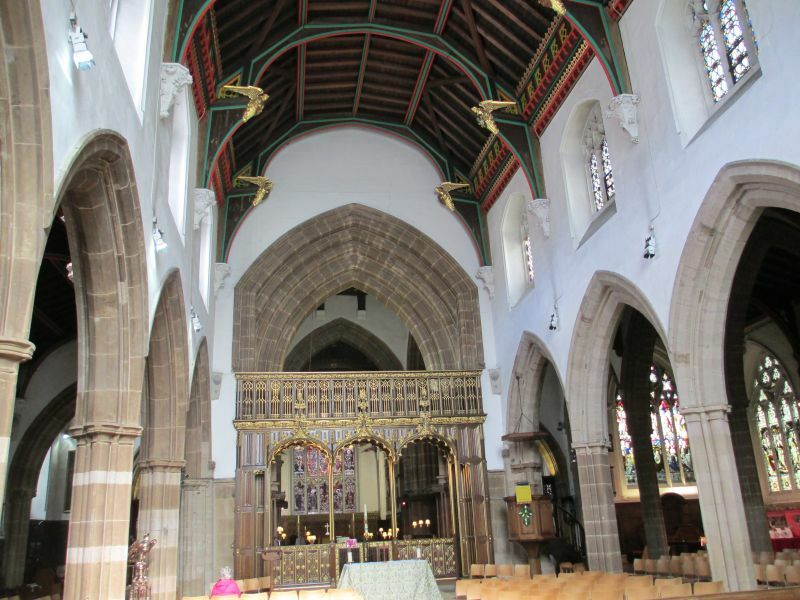 Leicester Cathedral: Looking down the nave of St Martin's cathedral towards the choir, chancel and alter, with the arches of the south aisle on the left. 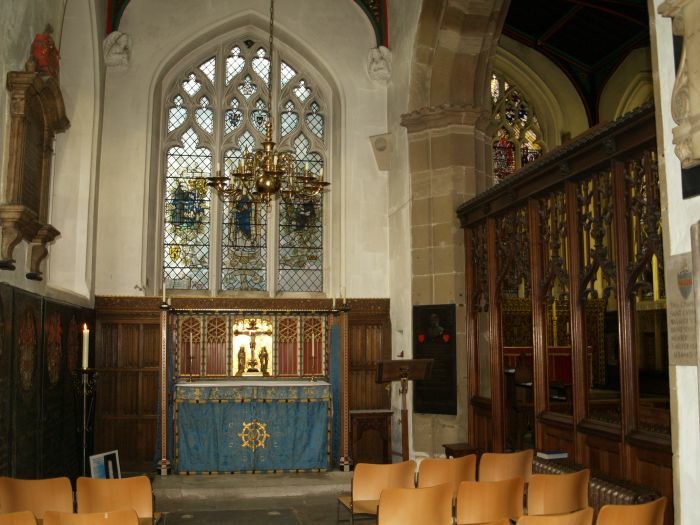 The chancel was rebuilt in 1409 and the north and south chapels added. 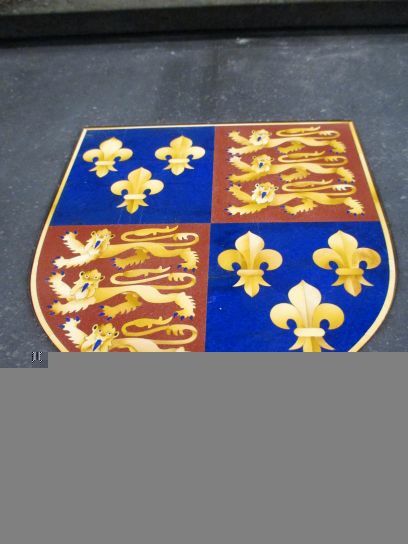 There were later considerable additions in the 15th-17th centuries. 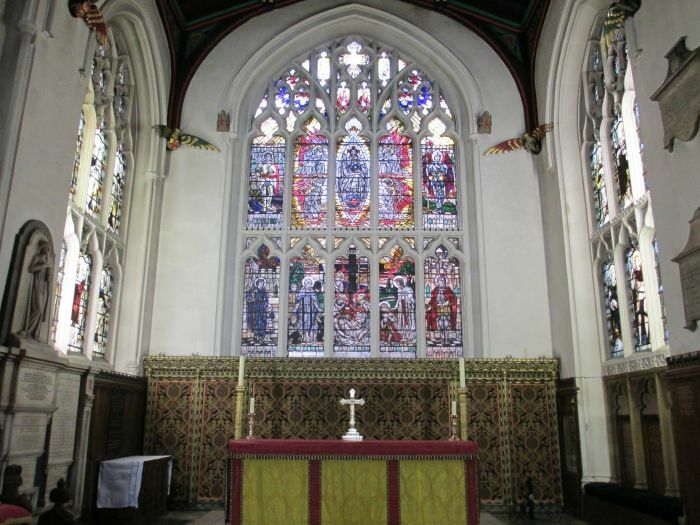 In the 19th century there was considerable rebuilding and restoration work as the church as, according to the new vicar of 1844, Mr Edward Thomas Vaughan, "The fabric is in a sadly decayed and decaying condition". 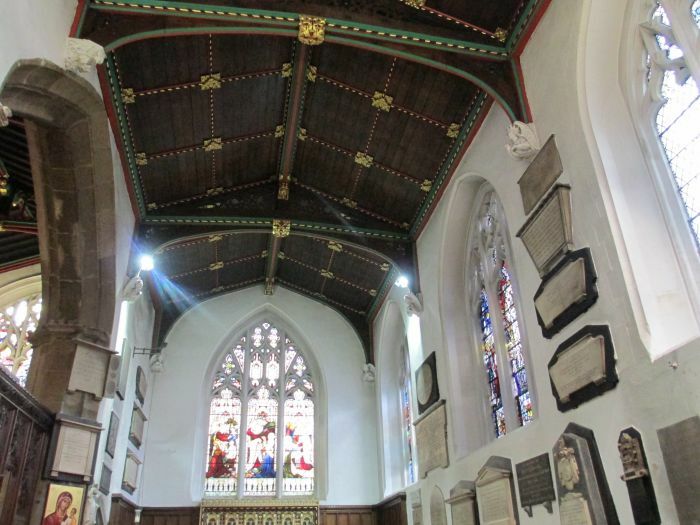 The old spire was taken down and a new 220 ft (~72m) one erected in 1867 onto the new tower built in 1861. 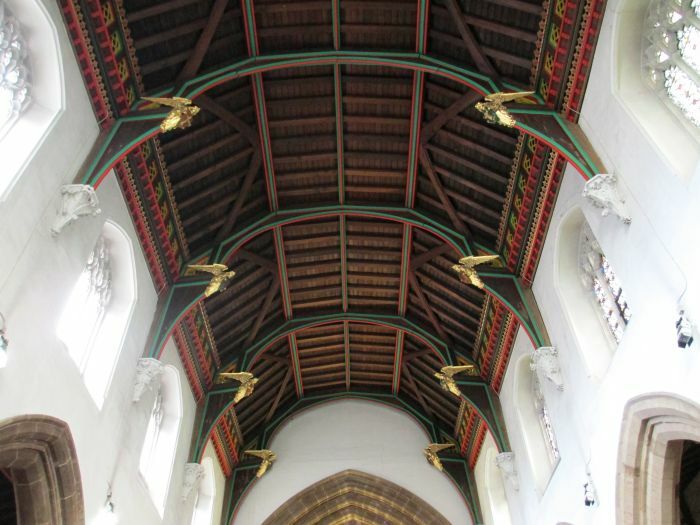 The large wooden screen separating the nave and chancel was designed by Sir Charles Nicholson and carved by Bowman of Stamford and presented when St Martin's became a cathedral in 1927. 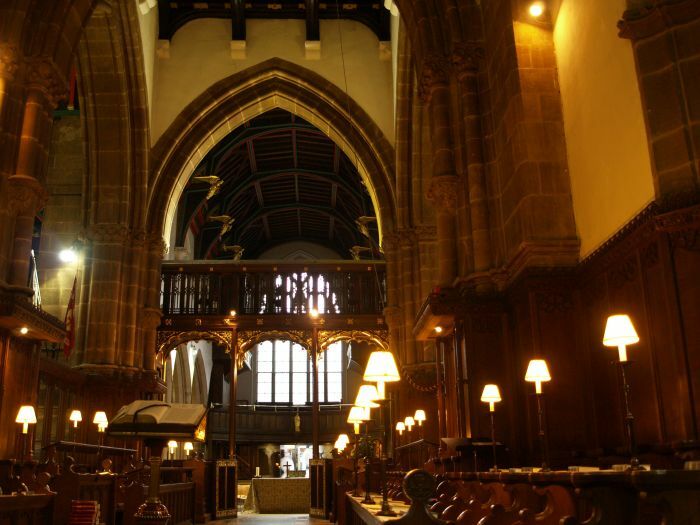 Leicester Cathedral: Looking west through the Choir down through the Nave. 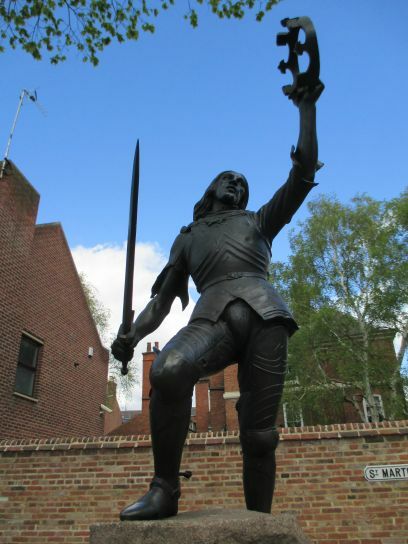 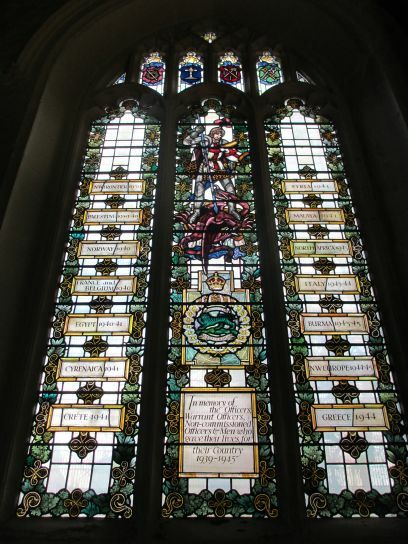 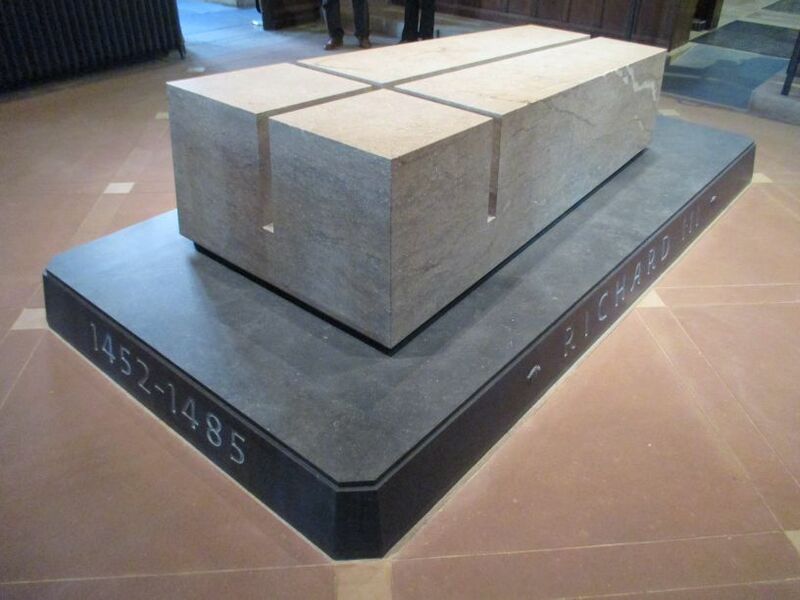 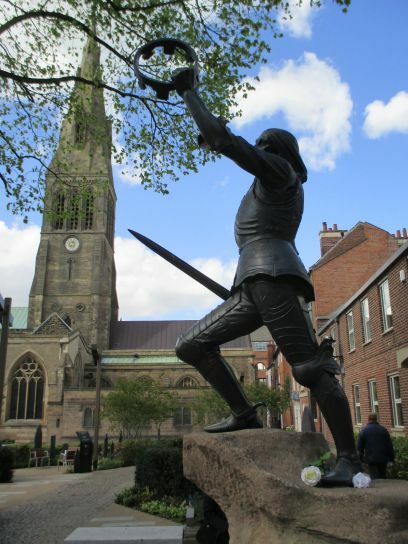 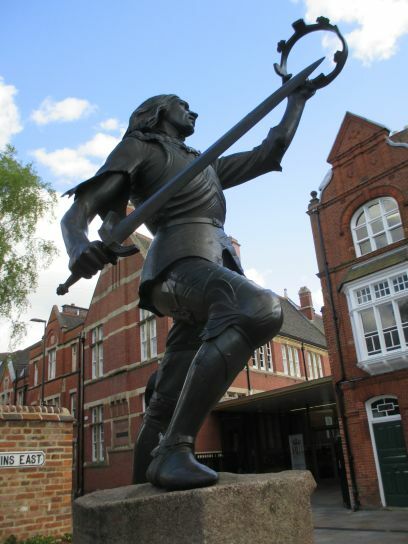 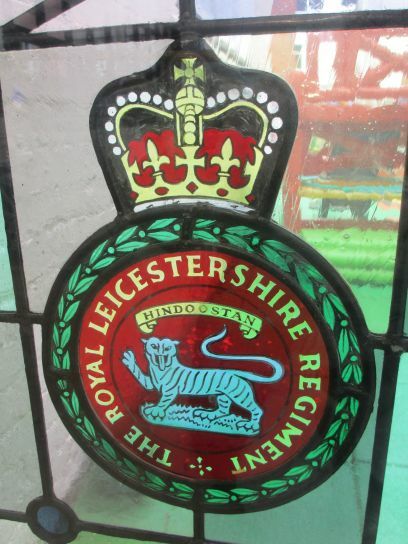 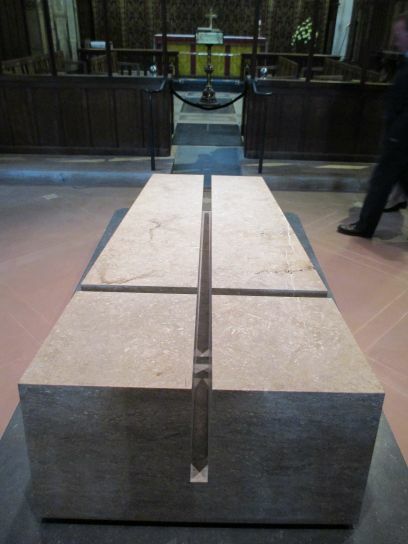 Leicester Cathedral: The memorial to King Richard III, the last of the Plantagenet dynasty. 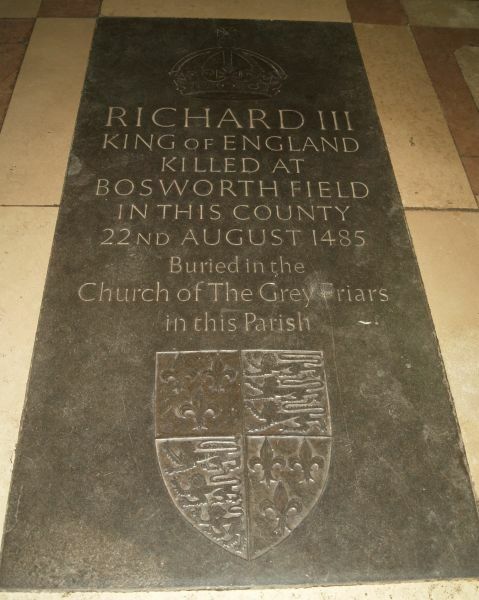 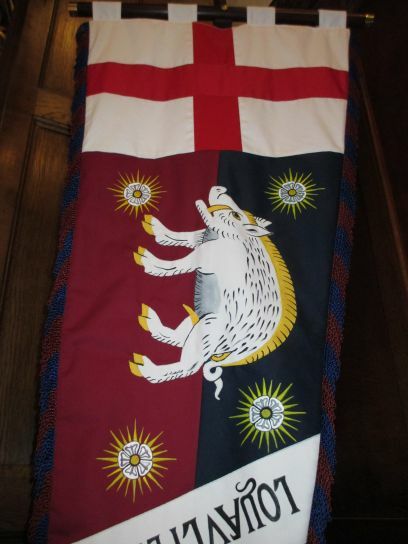 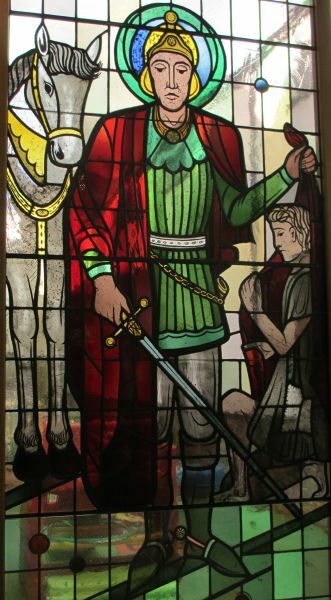 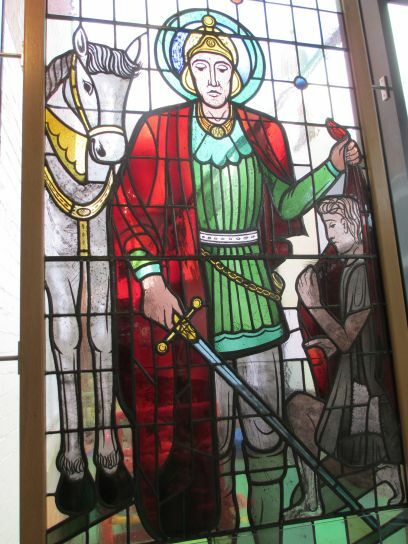 After he was killed at the Battle of Bosworth Field on August 22nd 1485, his body was buried in Greyfriars graveyard in St Martins parish. 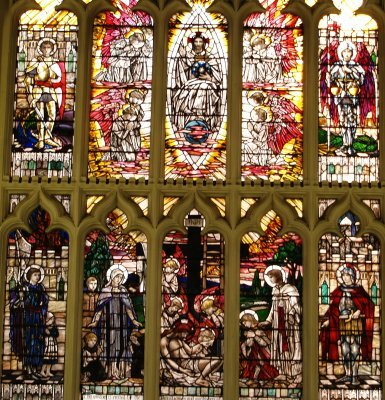 Near to the Cathedral in ? 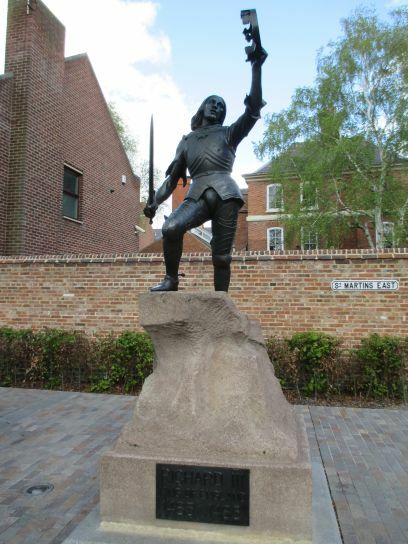 Street is another memorial plaque near where the church of the Greyfriars stood. 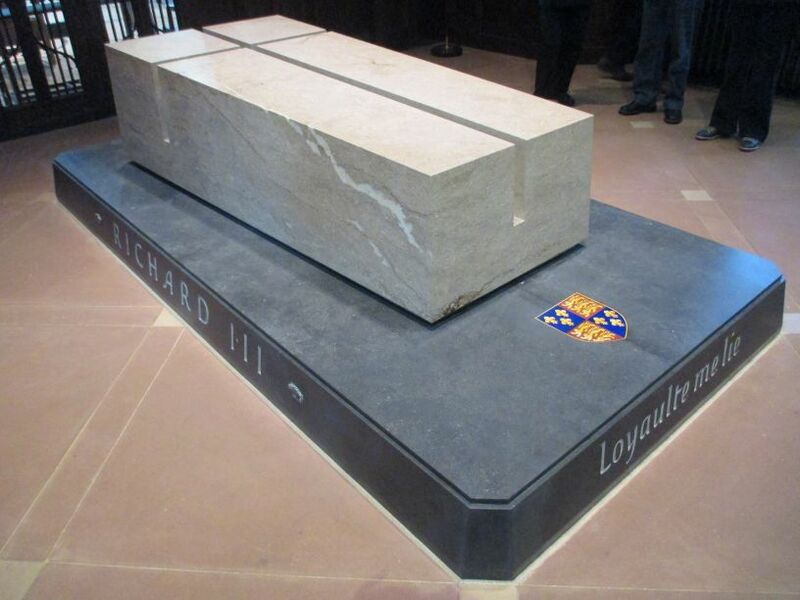 See section on Richard's tomb at the end of the page. 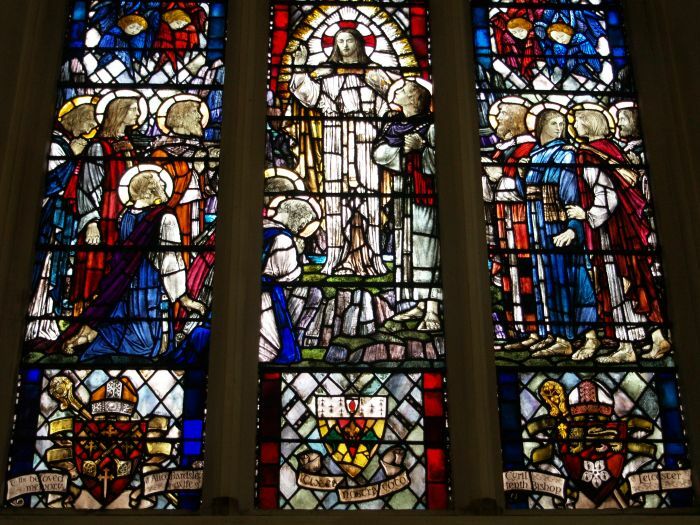 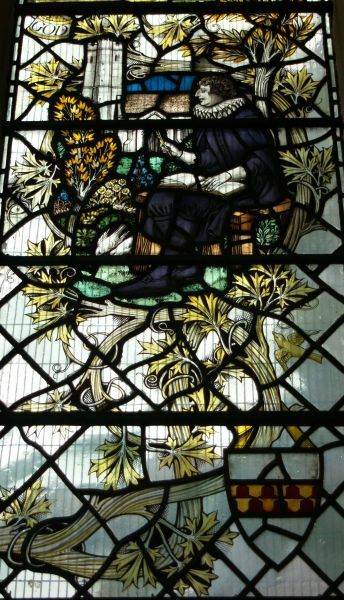 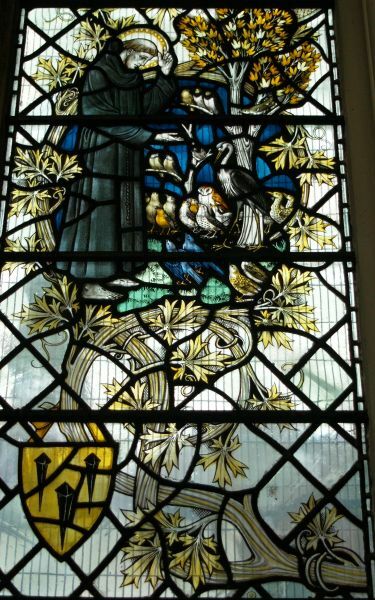 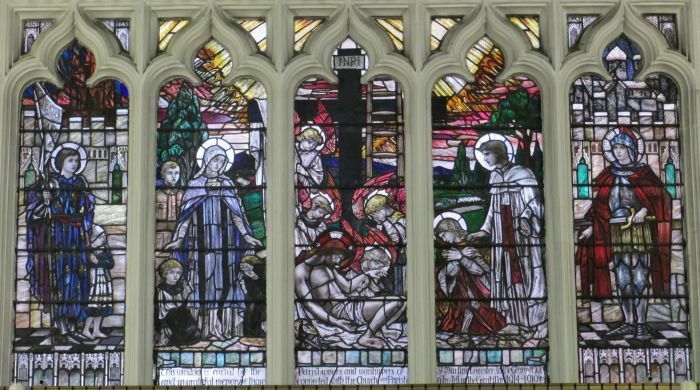 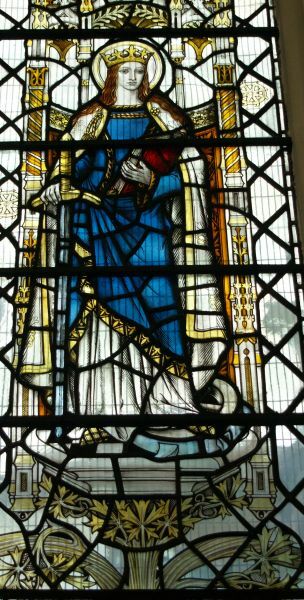 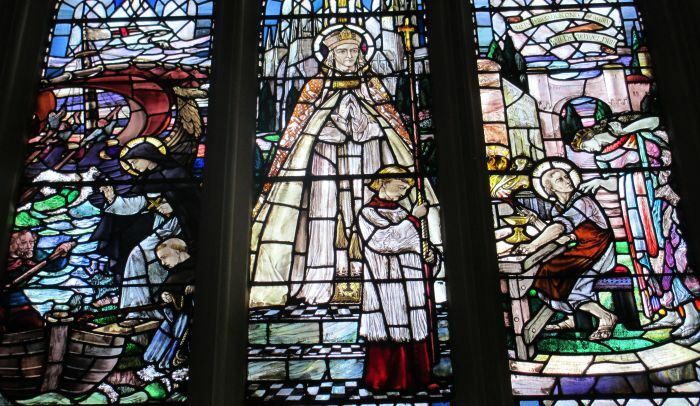 Leicester Cathedral: There is a fine three-light window (detailed pictures below), of which the centre panel of painted glass is dedicated to St Katherine herself. 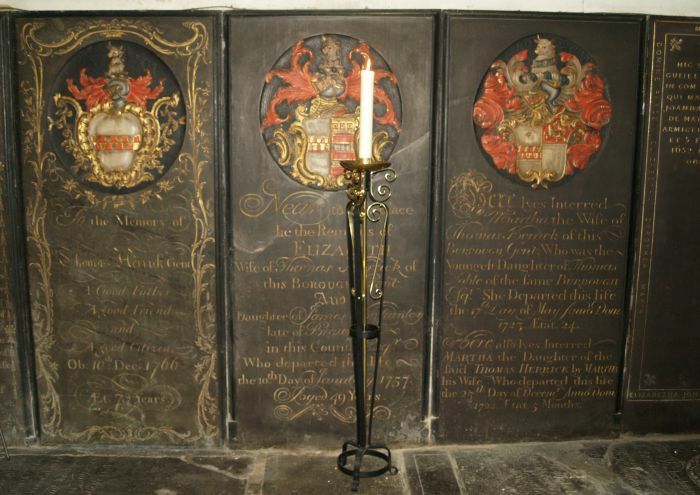 Leicester Cathedral: There are some 'colourful' gravestones in St Katherine's Chapel. 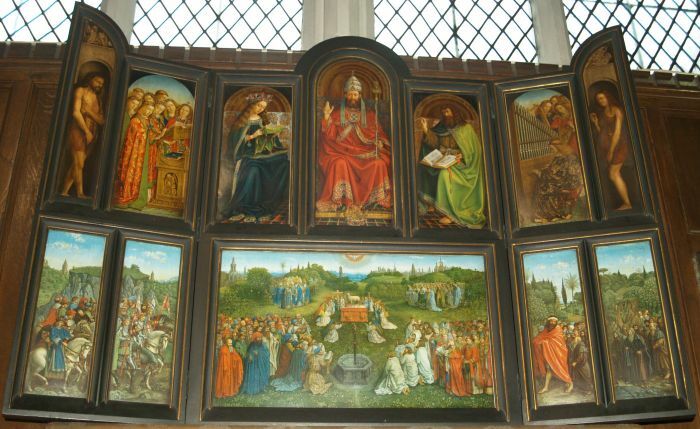 Leicester Cathedral: By St Katherine's Chapel is a copy of the Ghent altarpiece "The Adoration of the Lamb" by Van Eyck commissioned in 1420. 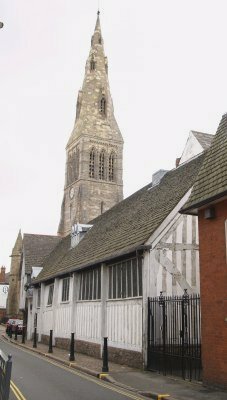 Leicester Cathedral: Looking out through the West door is the entrance to the medieval Guildhall. 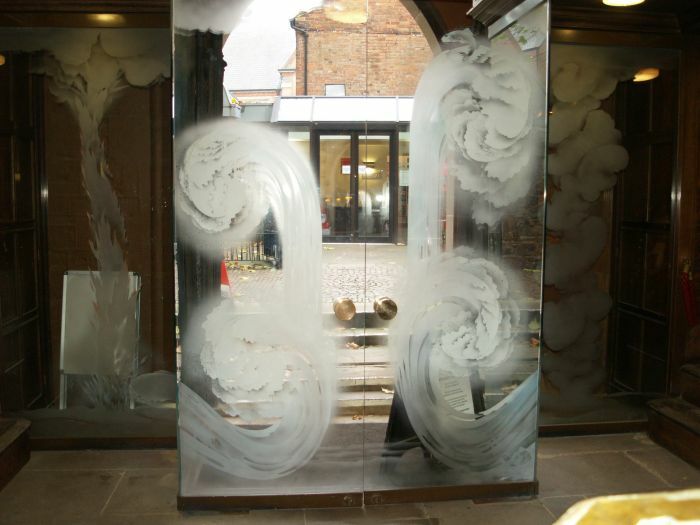 The glass doors, installed in 1996, depict the parting of the Red Sea and telling of God's people escaping to freedom in the Promised Land as told in the book of Exodus. 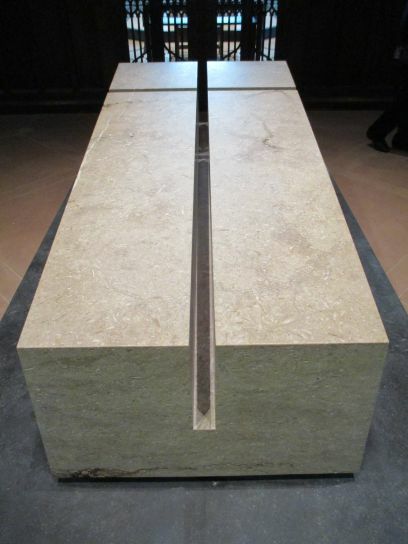 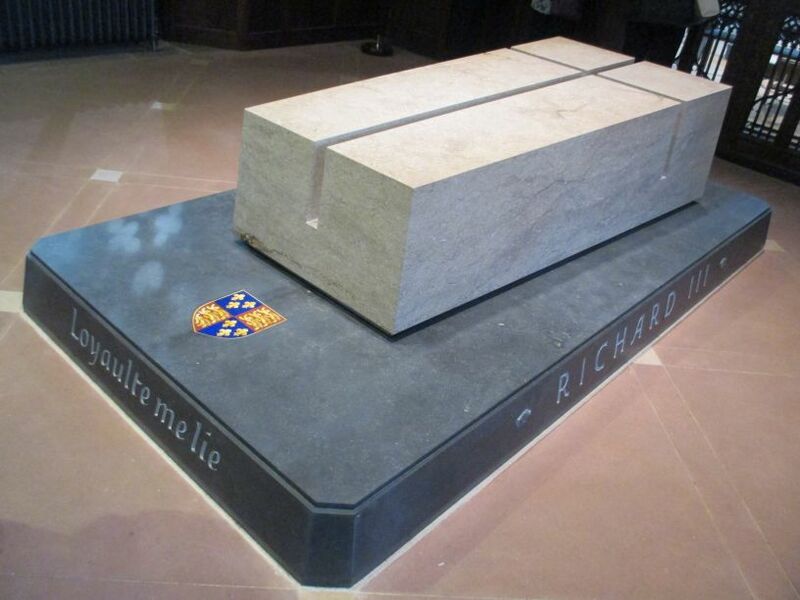 RICHARD III Loyaulte melie inscribed on the deep cut tombstone made of Swaledale fossil stone (quarried in North Yorkshire), with a base plinth of black Kilkenny marble from Ireland. 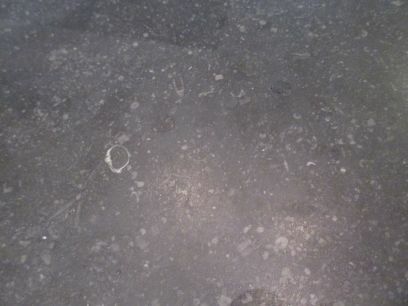 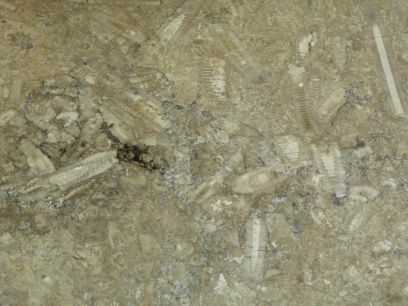 The fossils evident in the Swaledale fossil limestone (marble like) and Kilkenny black marble.